Bach is one of those composers who dazzle with the fecundity of their invention, and this new set from pianist Peter Hill gives us a chance to hear Bach's six French Suites (BWV812-817) played by one of the leading pianists of his generation. Best known for his playing of 20th century music and his relationship to Messiaen, Peter Hill has already released discs of Bach's Well Tempered Clavier on the Delphian label, and this new disc can be seen almost as a follow-up. Intriguingly Hill also includes his own completion of Mozart's Baroque-inspired Suite in C K399. The first thing that fascinates about this disc is the sheer sound world which Hill conjures. His playing is wide ranging and full of interest but with a very specific timbre and style. Bach's music in these suites almost approaches the galant style which was becoming fashionable amongst his contemporaries and Hill responds by creating melody which has a lovely sense of line and almost legato, a profoundly expressive touch. This is supported by a rhythmic left hand, which stays within the timbral locus of the right hand, yet is incisive and vibrant. Hill manages to avoid both an over romanticism and over emphasis. There are no rich legatos or soupy textures, nor is there any neo-HIP pecking. This is Bach played on a piano with finesse. Not everyone will like the rather magical, quite gentle atmosphere Hill conjures but I was very taken with it. From the easy, unconstrained motion of the fingers, from the beautiful touch, from the clearness and precision in connecting the successive tones, ... from the great variety of his figures of melody. I do not want to give the impression that Hill's playing is uniform, he responds wonderfully to the range of styles and textures which Bach presents the player. No-one really knows why the works are called French suites, not because they are explicitly written in the French style. In fact the term only appears 12 years after Bach's death and may simply be to distinguish them from the English suites, which were so-called because written for an English patron. So we have the standard sequences of Allemande, Courante, Sarabande, Menuet & Gigue with the odd Air, Polonais, Bourre and even an Anglaise. Though Peter Hill's rhythmic underpinning of the movements pays respect to the movements' dance origins, this is woven into the overall texture. These are performances where you understand it is a dance but do not necessarily feel impressed to get up an dance, whereas other performers bring out the dance element much more. 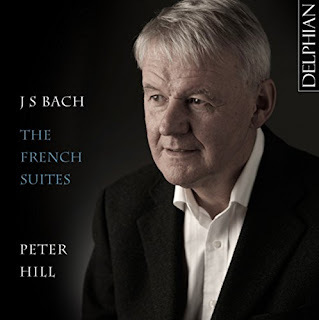 What seems to fascinate Peter Hill is the sheer fluidity of the music, as Bach keeps the architecture of the piece changing and with no two movements alike, and a remarkable flexibility even within the movements. On the whole this is not music where Bach is keen to display the profundity and complexity of his structural invention, instead we see what might be termed his lighter side. The keyboard music was assembled into sets in the 1720's and 1730's and there seems to have been a clear pedagogical progress from the two and three voice inventions and sinfonias, through the English suites and French suites, partitas through to the Well Tempered Clavier. The suites do not quite fill two discs and Peter Hill has chosen to finish, not with more Bach, but with Mozart's Suite in C K399 which was written in 1782 under the influence of Baron Gottfried von Swieten, librettist of Haydn's oratorios and for whom Mozart would re-orchestrate Handel's Messiah. Whilst the suite demonstrates Mozart's fascination with the Baroque and though it uses the familiar sequence of Ouverture, Allemande, Courante, Sarabande, Gigue, Mozart's music would not be mistaken for that of Bach or Handel. In fact, Mozart writing has a sombreness and a complexity of structure which is rather more apparent than Bach's suites.